What should I do if the app won't start or is crashing, freezing, or just behaving oddly? Why won't the app let me save images to my device's Photo Library? Why don't the animations appear to "play" when I save them to my device's Photo Library? Why can't I connect to the app's servers from my WiFi network? Does buying the "Mega Bundle" include the Add Text and Add Sound features? How do I get a refund for being billed incorrectly when I purchased or updated the app? Why can't my friends see any of the images I send them? Why are my Friends now only receiving a white box? Why do my friends receive SOME of the images I send, but not all of them? Why does my iPhone not have the Insert Multimedia button to the left of the input box in my Messages app (as shown in some of the tutorial videos)? Why doesn't the Paste button appear in my text messaging app when I tap in the input box (as shown in some of the tutorial videos)? Why does it sometimes take a long time to send an image? Why do I sometimes get a red exclamation mark saying the image wasn't sent? But I have WiFi. Shouldn't it always send MMS images fast? Why don't the Animations "play" when I post them to a wall on Facebook? Why is it saying I've reached my limit in posting to Facebook? Why am I getting an error message or having other problems when trying to post to Facebook? Why are the images not showing up on my Facebook page, even though the app said it posted them successfully? Why don't animations line up and/or "play" when I email them to certain friends, yet, if I email them to myself, or to other friends, they look fine? If you have friends who say they can't view the images you send them, read this section carefully. When sending multi-media text messages and emails to others, there are many variables involved which can create compatibility problems. When sending multi-media images to other iPhone users, it's unlikely you'll have any problems, however, when sending to friends who do NOT have an iPhone, there can be compatibility issues. Depending on what cell network and type of cell phone the person you're sending to has, the images you send may or may not work. This has nothing to do with the app, but is a factor of the compatibility between: 1) the iPhone, 2) your network provider, 3) the other person's network provider, and 4) the other person's cell phone. The app simply helps you find images to use with the standard, built-in iPhone, iPod and iPad applications such as text messaging and email. Images you find using this app will have the exact same limitations and compatibility problems ANY image would have on these devices, regardless of where you find those images. PLEASE don't give the app a poor review because there are MMS incompatibilities between your cell phone and some of your friends. We have absolutely no control over this, and it's not fair to penalize the app for incompatibilities which would be inherent with ANY image file, regardless of where you found it. If you're having compatibility problems sending certain media types to certain friends, there will not be ANY app in the app store which will solve the problem. Even using the iPhone, iPod or iPad's built-in apps will have the problem. Q: Why won't the app let me save images to my device's Photo Library? A: iOS 6.0 has new security features and you must now grant permission and "allow" an app to access your photo library if that app saves images to your photo library or imports photos from your library to be customized. To authorize our app: Run the Settings app on your device (the app with gears icon and shown below), then tap on the Privacy option, then Photos, then set the app to ON. Q: Does the app ever store or share my personal photos with others without my explicit permission? Even though the app never sends any of your images to its' servers, iOS still requires that you grant permission to any app before it can interface with your photo library. The app needs this permission if you want to a) save images from the app to your library, and/or b) import images from your library into the app to be edited, customized, etc. Q: Why don't the animations appear to "play" when I save them to my device's Photo Library? A: iOS's Photo app that comes with the iPhone/iPad doesn't support "playing" animations and will display any animation stored in your Photo Library as a flat, still image. However, the file is stored in your library as an animation and it will play if you share it later via an app that does support playing animations, such as the email app or the text messaging app. Q: Why can't I connect to the app's servers from my WiFi network? A: It's possible your WiFi router has a proxy or firewall setting that is preventing the app from getting to the app's servers. To test if this is the case, turn off the WiFi on your device and see if you can connect through your cell service. You can also test connecting from a different WiFi network (at work, a friend's, a Starbucks, etc.). If it works from your cell network and/or from other WiFi networks, you need to check the settings on your WiFi router. This is NOT a problem with the app, but with your WiFi router settings. Q: Does buying the "Mega Bundle" include the Add Text and Add Sound features? A: No. The Mega Bundle gives you all of the ANIMATION PACKS, but does not include the FEATURES. The Adding Text and Adding Sound features are sold separately and are not included in any of the Bundles. Q: Why can't my friends see any of the images I send them? A: Their network provider or cell phone may not support MMS text messages or may be incompatible with the iPhone or your network provider. Read more about compatibility problems and what you can do about them. Q: Why are my Friends now only receiving a white box? A: This has nothing to do with the app, but means your cell network provider isn't properly supporting MMS text messaging with iOS. This has been reported by AT&T customers in some parts of the country (such as Texas and elsewhere), as well as some other cell providers worldwide. Users with this problem are reporting that still Clip Art images will usually work, and even some smaller animations, but with many animations their friends don't receive the animation, but just get a white box or nothing. Only your cell provider can fix this problem (Animation Booth only provides the images, the Message app and your cell provider actually send the image, not Animation Booth).You may want to drop by the store of your cell provider and show them first hand what is happening by sending them an animation to their phone. You can show them it has nothing to do with Animation Booth by trying to send ANY big animation from another app or the web via text message. AT&T had this problem when MMS was first introduced in some parts of the country and eventually got it working everywhere, so it's likely they just need to work this out again for iOS in your area. Please don't give our app a poor rating for this problem, as we have no control over this. Q: Why do my friends receive SOME of the images I send, but not all of them? A: This is a problem with your cell network provider, and has nothing to do with the app. AT&T (and other cell network providers) will occasionally lose or "drop" a text message. This means you could send several messages, images, animations, etc., and your friend gets them fine, but then just randomly, one or two of your messages are never received on the other end. This can happen with a simple text message, not just photos and images. However, the larger the message, the higher the probability seems to go up that the message could get lost in AT&T's network. It's particularly frustrating, because you have no way of knowing that your message was never received, as it appears to send fine, so you don't know you need to re-send it. Many users have spoken to AT&T about this issue, and hopefully they will eventually solve this problem. Q: Why does my iPhone not have the Insert Multimedia button to the left of the input box in my Messages app (as shown in some of the tutorial videos)? A: This has nothing to do with the app, but means your phone or cell network provider isn't supporting MMS text messaging. The first thing to check is that you're on the latest version of the iPhone's OS (operating system). To do this, plug your phone into your Mac or PC and use iTunes to see if an update for your phone's OS is available. (To use MMS, you need to be on the iPhone OS version 3.1 or higher.) If you are on the latest version of the iPhone's OS, and you're still not seeing the Insert Multimedia button, then you should contact Apple or your cell network provider for assistance. Q: Why doesn't the Paste button appear in my text messaging app when I tap in the input box (as shown in some of the tutorial videos)? A: This has nothing to do with the app, but means your phone or cell network provider isn't supporting cut and paste in MMS text messaging properly. The first thing to check is that you're on the latest version of the iPhone's OS (operating system). To do this, plug your phone into your Mac or PC and use iTunes to see if an update for your phone's OS is available. (To use MMS, you need to be on the iPhone OS version 3.1 or higher.) If you are on the latest version of the iPhone's OS, and you're still not seeing the Insert Multimedia button, then you should contact Apple or your cell network provider for assistance. Q: What should I do if the app won't start or is crashing, freezing, or just behaving oddly? 1. Try killing the app from running in the background and restarting it. - Quit the app and be at your device's desktop screen. - Tap on the Home button two times to return to your device's desktop and then re-start the app. 2. Make sure you're on the latest version of the app. Run the App Store program on your device, go to the Update tab, and see if there is an update available for the app. If so, install the update. You can also manually check to make sure you're on the latest version by comparing the version number found on the app's Help tab with the version number found for the app in the App Store. AT THE SAME TIME, hold down BOTH the sleep/silence button (along the top edge of the phone) AND the big round home button (under the screen) for several seconds until the screen goes blank AND the Apple logo appears. Remember to keep holding both buttons down until the Apple logo appears. 4. Try clearing the Cache by tapping on the Help tab, and then go to Settings, and then Clear Cache. If you're still having problems after trying these five things, PLEASE let us know (email us at support@animationbooth.com), and we'll help figure out what's going on. Q: Why does it sometimes take a long time to send an image? A: How long it takes to send an image has nothing to do with the app, but is entirely up to: 1) the speed of your cell connection (Edge, 3G, etc. ), 2) the strength of your signal, and 3) the size of the image you're sending. The other factor is the size of the image you're sending. For this reason, we show you the file sizes of items you find in the app. The larger the file, the longer it will take to send. In most cases, Clip Art will have the smallest file sizes (usually under 25k), then Animations (usually 25k to 200k), and then Videos will usually have the largest files (usually 200k to 500k). If you have a slow connection or weak signal, you may want to avoid sending large files. Q: Why do I sometimes get a red exclamation mark saying the image wasn't sent? A: As explained in the previous question, if you have a slower cell connection or a weak signal, it can take a long time to send a message. If it takes too long, the iPhone will time out and show you the red exclamation mark, as shown above. You can tap on the exclamation mark to try sending the image again once you have a stronger signal. TIP: If you keep getting this error and you're somewhere that you normally have a good signal, try putting your iPhone into "Airplane Mode" for a few seconds, then turning the Airplane Mode back off. This will force the phone to make a new connection with your cell network, and this will often help. If you have constant problems sending MMS text messages, you should contact your cell network provider. Q: But I have WiFi. Shouldn't it always send MMS images fast? A: No, because the iPhone does NOT send text messages using WiFi. Even if you're connected to a WiFi network, the iPhone will ALWAYS uses your cell phone's network provider for sending text messages. Having WiFi DOES make running the app faster (as it pulls images from our servers using the Internet), but when you go to actually send the images in a text message, the speed will be determined by the speed of your cell connection and your signal strength. Q: Why don't the Animations "play" when I post them to a wall on Facebook? A: Facebook does not allow ANY animations to "play" on their site. So, you can send Animations to Facebook, BUT they will appear as a flat, non-animated image. PLEASE NOTE! This is a limitation of Facebook, not the app. PLEASE don't give us a bad review for this, as we have no control over Facebook's no-animation policy. Q: Why is it saying I've reached my limit in posting to Facebook? A: Facebook limits the number of posts a user can make using 3rd party applications. If you get an error saying you've reached your limit, you will need to wait 24 to 48 hours before Facebook will let you start posting again. PLEASE NOTE! This is a limit placed by Facebook, not the app. PLEASE don't give us a bad review for this, as we have no control over this. Q: Why am I getting an error message or having other problems when trying to post to Facebook? A: If you are trying to post to a group or a friend's page and you get an error 10000 (or some other error), this means that group or friend doesn't allow other people using 3rd party apps to post to their page. This is a restriction with Facebook and there isn't anything the app can do to get around this. If you were trying to post to your own page and are having problems (for example, the image you tried to post doesn't ever appear on your page, and you didn't receive any error message), please read the information below, including two things you can try to remedy the problem. When iPhone apps communicate with Facebook, they do this through what are called "APIs." These are the tools Facebook provides for applications to work with their site. For security reasons, 3rd-party apps like this one MUST use Facebook's APIs when communicating with Facebook. This protects your Facebook account information from being abused by 3rd-party vendors. When posting to Facebook, the app passes the necessary information to the Facebook API, and Facebook does the rest. It's not uncommon for Facebook's APIs to be down or have problems from time to time. When this happens, it will sometimes produce an error of some sort (Error 10000, 5000, etc. ), not let you login, not post images, or have other problems trying to post. 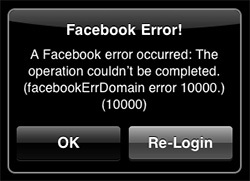 Such problems and error messages are coming directly from Facebook, NOT from the app. We have absolutely no control over this. In most cases when this happens, all the user can do is wait until Facebook corrects the problem and it starts working again. This can take anywhere from a few minutes, to a day or two. Keep in mind, that Facebook has thousands of servers, so it's not uncommon for one user to be getting these errors, and other users not to have any problems. PLEASE REMEMBER! These error messages are an issue with Facebook, not the app. PLEASE don't give the app a bad review when this happens, as we have no control over this. Their are two things you can try that might help un-jam any problem on Facebook's end. First...try to log out of Facebook from inside the app, and then back in. 1. If there is a Re-Login button on the error message, tap that and try re-posting. If not, continue with the steps below. 2. Go to any image and tap on the Share button. 3. Tap on the Facebook button. 4. Tap on the Remove Attachment button (if there is one). 5. Tap on the Logout button. 6. You will be asked to login again the next time you go to post an image to Facebook. 1. Login to your Facebook page using a web browser. 2. Drop down the menu by clicking on the down arrow in the top, right-hand corner, just to the right of the Home link. 4. Find the Animation Booth app and click on the X button to remove Animation Booth from your account's list of approved apps. 5. Now, return back to your iPhone or iPad and run the Animation Booth app. Go to the Help tab, and then to Settings button. Tap on the Logout of Facebook option (if you're logged in). Then log back in. Try to make a post again and see if it works. On some occasions one of the above two processes might help, although often you just have to wait until Facebook gets things sorted out on their end. Q: Why are the images not showing up on my Facebook page, even though the app said it posted them successfully? 1. From a web browser, go to your Facebook page. 2. In the top right-hand corner you'll see a down arrow to the right of your name and the Home link. Click on that down arrow to pull down the menu and select Account Settings. 3. In the left column, click on the Apps link. Q: Why don't animations line up and/or "play" when I email them to certain friends, yet, if I email them to myself, or to other friends, they look fine? A: How an email is formatted, and how it looks when it is read, depends upon the email "client" (program) that the person you're sending the email to uses to read their emails. There are hundreds of different email clients, and each behaves differently. The app sends messages using the most standard formatting (HTML), but each email program will handle displaying HTML messages differently. For example, some people read their emails using a client application on their computer, such as Outlook. Some will use a web browser, such as Yahoo, Google and Hotmail. Many people will read emails from their cell phone. Each of these methods behaves differently. Some email programs, particularly on older or lower-cost cell phones, may not even support HTML, and won't show the images. Some email programs will show the images and animations fine, but the animations won't "play" or be animated. Other email programs will show any images as attachments, and won't format them how you had laid them out. For example, the email application on a Mac computer (called simply Mail), will lay out the images properly, but it will not "play" any animations. However, if you read the exact same email on your iPhone or iPad, any animations WILL play and be animated. Of course, the app has no control over this. All we can do is send the emails in the most standard HTML format, and then it's up to the email program reading the email as to how it chooses to display the message. Q: How do I get a refund for being billed incorrectly when I purchased or updated the app? A: All sales of our apps are done by Apple using their iTunes App Store. All billing or refund issues need to be handled by Apple. You can contact them at: iTunesStoreSupport@apple.com. Thanks for using this app. If you have any questions, suggestions, feedback, or need help, we'd love to hear from you. Please email us at support@animationbooth.com. We can usually get back to you within an hour or two, so please don't hesitate to write.